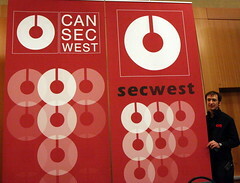 At this year’s CanSecWest, researchers were demonstrating with eight dollars of equipment, they could basically read your keystrokes through the vibrations through different keystrokes and that through the same electrical grid, you could actually detect keystrokes through a D/A converter and oscilloscope. What’s interesting is that the article talks about the NSA project coined TEMPEST, which is something that I learned about back in the 1980s. There’s a lot of different stories about how this is supposedly come to be but the point of the story was that with sensitive enough equipment, you could actually sniff out conversation pieces coming from the distortions from monitors and other types of displays. Now, from a physics perspective this actually does make some sort of sense since there are fields that would be slightly distorted from sound waves. This does change with the shift in display technologies from CRT to LCDs and plasmas. But I digress. Now what would definitely be interesting is actually using the minute magnetic fields generated by electrical grids to track movement. That’s actually a lot easier in my opinion since the distortion pattern would be a wave running against a field as it displaces it like in water. If there is enough motion, then you could technically seek out individuals based on their electrical wiring. Theoretically anyways. What can I say, the real information gathering stuff has always been a close second to my heart.